Samsung Galaxy Workshop: Turn Pro At Smartphone Photography! This Samsung Galaxy Workshop Has Helped Us Turn Pro At Smartphone Photography! We can speak for most of the millennials out there when we say that we can’t get enough of experimenting with smartphone cameras. We are the generation that loves clicking, uploading and are in awe of amazing shots by those who’ve mastered smartphone photography. And, even though we are getting good at smartphone photography, there's one product in the market that aims to take this up a notch. Samsung recently launched its flagship phone - Galaxy Note9 with some really cool features and organized a country-wide Galaxy workshop. The Galaxy workshop saw Note9 fans and budding photographers in attendance for a session with an expert and learned about the art of capturing perfect photos and videos using some kickass Note9 features. Read on to find out what we learned and how we can all turn pro at smartphone photography. Neeta Shankar - a photographer by profession, led the Galaxy workshop and took us through a 90-minute session where we learned the tips and tricks of using the smartphone camera for maximum result. The Galaxy workshop not only gave wonderful insights on how to overcome various nuances of smartphone photography but saw participation from people of different age groups and from various walks of life. One of the nuances being low-light captures. Not every phone can capture great images in low-light and Samsung Galaxy Note9, with its dual aperture camera, is a clear winner! What stood out for us at the Galaxy workshop was the intelligent scene optimizer feature. When it comes to smartphone photography, you usually end up thinking more about the light, colors, lines and the placement of your object. Now, if you are shooting with Note9, it will automatically recognize the subject and optimize the camera for a perfect photo. This is perhaps the easiest feature which will have your Instagram pinging with likes within minutes! Apart from the scene optimizer, Note9 has a really cool super slo-mo which can add drama to your everyday videos. Notably, the phone has AR Emoji, which adds flair to our everyday conversation with friends, comes loaded with hyper-lapse to capture great passages of time, and flaw detection to remove blinks, red eye, smudges etc. Watch the video that captures the Galaxy workshop in detail. With Smartphone photography on the rise, it’s very important for budding photographers and bloggers and anyone who is interested, to learn about all Dos and Donts. Let’s face it, all of us carry a phone 24/7 AND click pictures all the time, but most of us have just been winging it. Thankfully Samsung has found an efficient way to bridge this gap, not just for photographers but also for anyone who has been waiting to amp up their Insta-game! 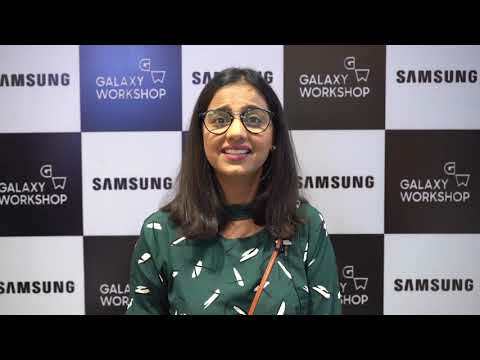 If you too want to attend future Galaxy workshops, keep a tab on Samsung India's Facebook and Instagram page for updates!